‘The World’s Least Realistic Pool Simulator’ is quite the curious statement. Usually, games are competing to be the best representation of a sport or most accurate. Not Pool Panic though. Developer Rekim has instead opted to lean heavily into the weird and wacky. The truly surprising. And sure there are elements of the game of pool on display here, but it really takes a back seat in favour of Pool Panic’s outlandish style and numerous ideas. The game doesn’t hesitate in throwing you straight into the action – a short tutorial teaching you the basics of shot taking being all you get before placing you in a huge and initially confusing world map. Strewn across this vast world are a number of quirky secrets to discover, new paths to unlock and over 100 individual stages to best, each of these putting you in a weird and often humorous situation. You see while the goal of each stage in Pool Panic may be to pot all the coloured balls before finishing with the 8-ball, everything from the environment you’re playing in to the balls themselves are as far away from the hobby as you could get. In fact, Pool Panic feels more like a physics-based puzzler than a traditional take on the cue sport. Let’s start with you – the cue ball. Controls are kept very simple and play out as you’d expect from any pool game. When you’re ready to take your shot, a line appears showing the path your cue ball and any you hit thereafter will travel. The ZR Button handles more powerful shots while a delicate touch can be applied with the R Button. Interestingly though, your cue ball has a long pair of legs allowing you to move freely around between shots wherever you wish. While this may sound like it’d make the game too easy, bear in mind it’s not just your ball that possesses unique abilities. The coloured balls you’re trying to pot too have their own traits and quirky appearances that essentially act to make your job more difficult. Yellow and red balls react as you’d expect (in that they don’t do much of anything and actually go where you’re aiming them to go) making them the easiest to contend with. The greens meanwhile sprout arms and act as goalkeepers blocking balls from getting past them. Orange are equipped with roller-skates and dart out the way of incoming shots meaning your best course of action is to hit another ball into them. Pink prove especially tricky adding spin to a shot when contact is made. There are plenty of personalities to deal with in all and understanding the best way to pot them is essential, especially as things get crazier and more complicated. It should come as no surprise but instead of a pool table (seldom do you really find yourself on anything close to a traditional table) you’re actually firing your cue ball across a range of mundane and strange locations – everything from camping sites, pirate ships and roads to desert landscapes, chicken coops and churches. The sheer range on display never fails to surprise, each accompanied with its own obstacles and gimmicks. A picnic area in the woods, for example, hides raccoon dressed balls high in the trees, only potable after you’ve knocked them down with a smack to the trunk. A western themed stage meanwhile houses a number of horse outfitted balls while also arming you with a gun instead of your usual cue. Each stage you face dangles the same four objectives over your head, some of them truly devilish. The first is to simply pot every ball, a task often mandatory for most stages. Finishing the level within a certain time limit or a number of shots are easily the toughest to complete while the final task challenging you to never pot yourself or the 8-ball out of turn again isn’t exactly easy. They certainly add replay value but due to their harsh difficulty, I often found myself content with simply completing the stage and moving right onto the next. Fact is over the course of your journey you’ll face off against such a wide array of obstacles and puzzles, both enjoyable and frustrating. You’ll learn to hate certain coloured balls every time they show up – often the ones posing most trouble to pot. On the other hand, there are ideas that truly impress with their ingenuity – a good example being certain ball types that cause the hole they’re potted in to disappear and also leave a laser-like fence behind making future shots tougher. The game’s Story Mode should keep you plenty busy with its generous amount of secrets and stages to discover, however, Rekim haven’t stopped there. Panic Mode is a randomly-generated endless option of sorts, great for short bursts. Multiplayer meanwhile is an unexpected and amusing addition playable for up to four participants. ‘Table’ is essentially a chaotic race to pocket balls scattered on a table, the winner being the first to sink the 8-ball. ‘Party’ is even more unpredictable, matchups consisting of five rounds, each having you and your opponents compete in a random activity. ‘Zombies’ has you try to stay away from a swarm of infected balls, the last person (or rather, ball) left standing the winner. ‘Sumo’ meanwhile is all about knocking your opponents off an arena whilst staying on yourself. There’s a healthy mix of event types here and while not all a hit, the good certainly outweighs the bad. As bizarre as Pool Panic can be, often times that can also prove problematic especially since the game doesn’t do a great job displaying nor communicating what is going on. Take the non-adjustable camera angle for instance, not so much an issue in the early goings but particularly irritating as the field becomes more cluttered. As great as the visual style is, it also results in overlapping of the balls and objects sometimes even obscuring your view from something important. Most pool games offer a birds-eye view of the table and something like that in Pool Panic would go a long way in solving this problem. Some things lack clarification too, often leaving you scratching your head. The four goals within each stage, for example, aren’t immediately clear to begin with while multiplayer essentially leaves you to figure its mini-games out for yourself. As you play, you’ll pick these things up but it still seems odd there’s very little in the way of explanation or even hints. Special mention needs to go to the game’s visuals, a daft and weird Cartoon Network style 3D world whose occupants are completely 2D. It’s a strange look but one that truly sets it apart. The personality of the game’s many characters shine too, despite the fact they are essentially pool balls. 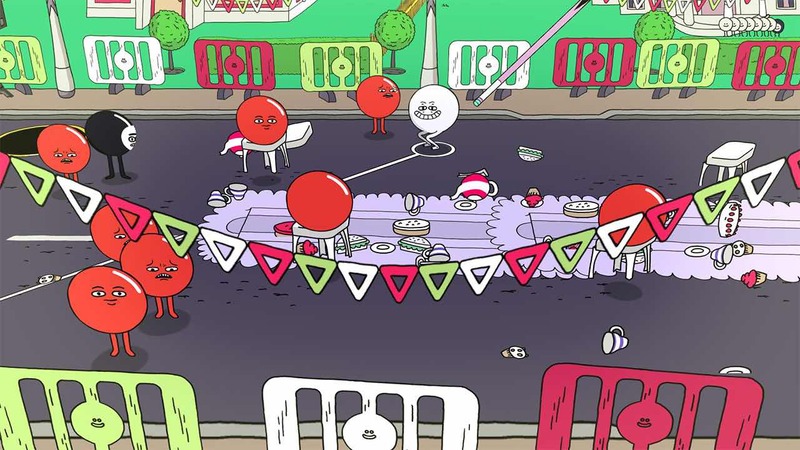 Pool Panic is wonderfully weird and so imaginative. While this probably won’t please those after something a little more traditional, its focus on physics-based puzzles is certainly an interesting take. Frustrating, lacking direction but with a world full of character and unique ideas, Pool Panic can be a really fun time albeit one that’s known to scratch every so often.